A 12-year-old boy is the lone survivor of a plane crash, and now he must survive in the wilderness, with nothing but a small hatchet as his only tool. 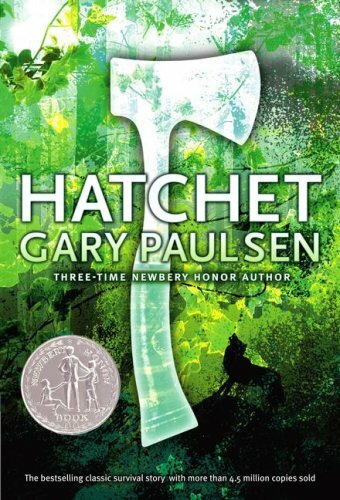 The best thing about a book like Hatchet is that it tells the story about a situation you never want to be in, but that you always picture yourself in. In this way, you’re allowed to experience all the discomfort, anxiety, and fear without actually having lived it. All of this realness is made all the more profound by the fact that the author actually experienced much of what Brian does in the book. A great tribute to this book is the fact that I continued to think about it long after it was over. What I only realized until after I was explaining the book to someone who hadn’t read it was that the overall message was that the human spirit can endure even when the body and mind are ready to give up. Brian was almost resigned to the fact that he would surely die alone and undiscovered, but something within him wouldn’t let him give up, something he couldn’t even control. His spirit drove him to search for water, to hunt for food, to learn the tricks of fire, food, and survival. There is a great line that recurs throughout the book: “There were these things to do.” It was something Brian said to himself as a way of fending off despair by focusing on the tasks at hand. It was one of the pieces of quiet wisdom he learned during his ordeal that became the foundation of his will to continue living, no matter how hopeless his circumstances. These are the kinds of elements to the book that make it so striking, so believable, and, somehow, so reassuring. I kept thinking maybe even I could survive if I was alone in the wilderness, too…. I liked that I continued to think about the book when it was over and that it was based on some of the author’s own experiences. You can’t fake that kind of authenticity, and I really appreciated that the author didn’t write about something he didn’t know. 4 boots. I would recommend this for boys and girls, ages 9 to 14. It was intriguing and very exciting.